Well, I've just returned home to the U.S. from my trip to England and already I'm missing the fun I had and the friends I made, while there! 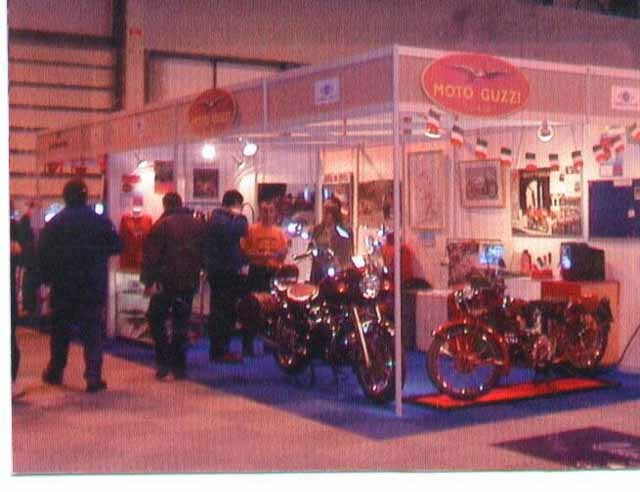 I was in Birmingham from November 14 to the 18, 2002 at the National Exhibition Center for the International Motorcycle and Scooter Show, where I happened to have the good fortune of working along with other Moto Guzzi Club GB members on their club stand. What a great bunch of people they are and I mean that sincerely! I had a lot of fun working the stand and enjoyed the camaraderie of visitors and friends of the club. We signed up many new members and answered questions from people who were just passing by. Many of them didn't know what a Moto Guzzi was, but seemed interested, just the same. We also had quite a bit of fun in the evenings after the show at the cottage, the club rented for the people working the show. There we ate, drank, and told a lot of stories about past motorcycle trips and rallies. I've got to say, the Moto Guzzi Club GB is a very well organized club with enthusiastic Club Officers. And my hat goes off to Mike Lacey for the excellent job he did organizing the NEC Show and lodging! 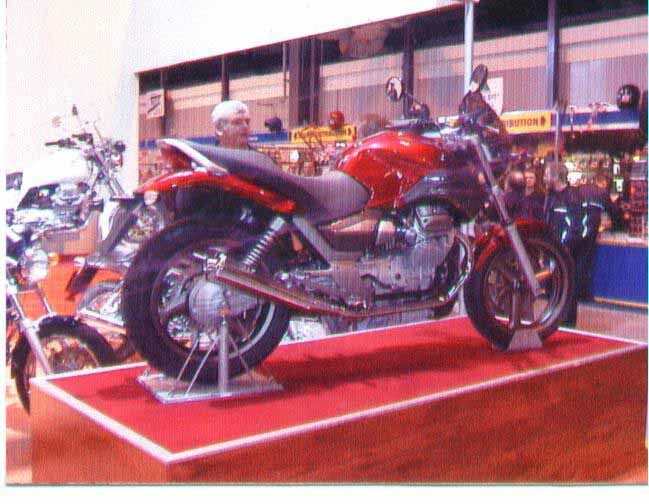 Moto Guzzi UK had quite an impressive stand at the show also, with many new models on display. The 750cc Breva looked really nice and would be a great model for those looking to purchase a new Moto Guzzi with smaller displacement. I just hope this bike makes it stateside. [Ed Note: The last word I heard is the Breva will be here this spring. -FW] And the MGS/01 is truly something to behold. What a beautiful piece of exotic Italian machinery this bike is. Eat your heart out Ducati and MV Agusta! 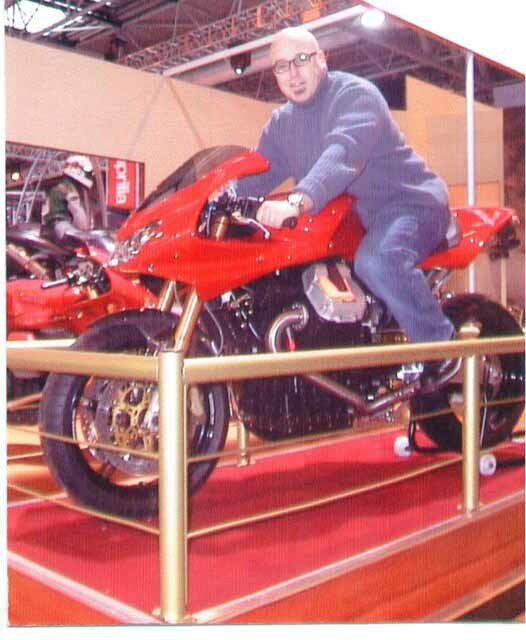 My only disappointment was that I didn't get a chance to sit on the Griso, as there wasn't one on display. Ashley Law, V11 Tenni rider at the Isle of Man TT this year was there with his friendly, good-natured personality. His presence added the finishing touch to the Moto Guzzi UK stand, as he is very personable and spent time talking with everyone who showed interest in Moto Guzzi. With youth and enthusiasm on his side, he can truly promote our unique brand. All and all, it was a very enjoyable trip for me, meeting a lot of nice people and making many new friends. I had the opportunity to work along side Mike Lacey, Pete and Sue Creech, Gwen McPherson, Mel Robinson, Ken Wallace, and Nigel to name a few. I'm sorry if I left anyone out, but I have a poor memory for names. Anyway, I look forward to attending my next Moto Guzzi Club GB event. Scott Seiber, Philadelphia, MGNOC #18506.